The leader of the House of Commons has questioned the viability of the proposed high-speed network should HS2 bosses decide to cut the frequency and maximum speed of trains in a bid to cut costs. Writing to Andrea Leadsom, Mark Thurston, chief executive of HS2 Ltd, confirmed that a number of options were on the table when it came to reducing costs and included “possibly lowering the speed that trains will operate at on the line by around 50 km/h, reducing the number of trains from 18 per hour to 14”. 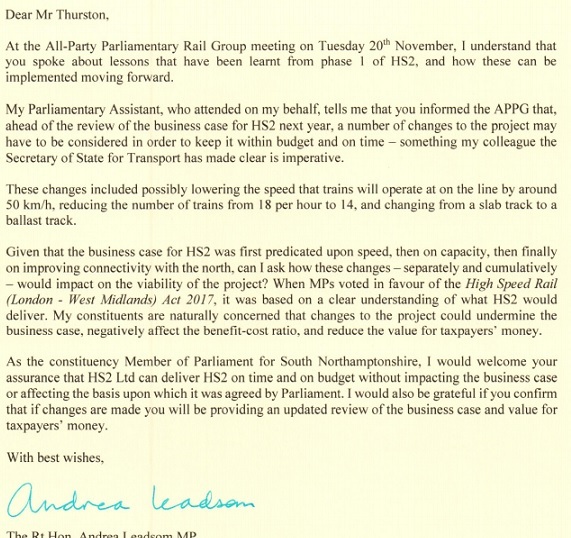 The MP for South Northamptonshire has published letters she has sent and received from the rail boss in which Thurston confirms his comments at an earlier All-Party Parliamentary Rail Group on 20 November but also reaffirmed intentions to work to the original cost and scope. In her letter, Leadsom said her parliamentary assistant who attended the meeting informed her of a number of changes to the project that may have to be considered in order to keep it within budget and on time. But Thurston has recently responded to the cabinet member by attempting to reassure the leader of the house about the meeting last year. On her website, Leadsom has said she will be writing once again to ask Thurston for an update on any preparatory work HS2 Ltd is undertaking to bring forward such changes, and what impact they project the changes may have on the business case.